There are increasing calls for unity within the French left, which is divided like never before. But with less than four months to go until the European elections, attempts to bring left-wing groups together are struggling to gain traction. EURACTIV France reports. The latest poll by OpinionWay/Tilder published on 31 January showed that both the lists of La France Insoumise (LFI) and Europe Ecology – The Greens (EELV) would receive 8% of the vote, while the French Socialist Party (PS) would gain only 6%. The Génération.s movement co-founded by Benoît Hamon, formerly a candidate for the French presidential election for the Socialists, would remain outside the European Parliament, with 4%. So, too, would the French Communist Party (PCF), with 2%. However, uniting these parties under a single banner could stand to attract almost as many voters as the centrist La République En Marche (20%) and the far-right Rassemblement National (22%). This would also ensure that the French Left has a significant delegation of MEPs after May 2019. Currently, there are 12 French Socialist MEPs, while the Greens have 6, and the Communists and La France Insoumise together have 5 MEPs, after Emmanuel Maurel left the French Socialists. This amounts to a total of 23 MEPs of the 74 French deputies. In 2014, the radical left was able to unite under the ‘Front de Gauche’ alliance. At the launch of the French Communist Party’s campaign on 5 February 2019, the leader of its list, Ian Brossat, left the door open for alliances on the left. However, it seems unlikely that La France Insoumise and the communists will get closer. Socialist voters are currently divided between the list led by the Socialist Party and the one headed by the former presidential candidate, Hamon. The latter has advocated a coming together of the French left, repeatedly calling for a union with the other parties. In order to avoid the lists being scattered, the co-founder of Génération.s has proposed a “citizen voting” process to serve as the basis for a common list. Hamon hopes that holding a citizens’ vote would result in the creation of a list and a joint programme for the European elections. “We are currently extending an invitation to leaders of lists and political forces, and, more broadly, to intellectuals and citizens’ movements, so that they register for this vote and respond before 22 February,” Hamon specified in an interview with the daily newspaper Le Monde. In addition to La France Insoumise, the French Socialists, the Greens and the Communists, Hamon also mentions the radicals of the left (LRDG), the citizens’ movement Nouvelle Donne, Yanis Varoufakis’ DiEM25 and Raphaël Glucksmann’s political movement Place publique. Voters would be called upon to specify their three preferred lists in order of hierarchy. In order to reach a decision on differences in the parties’ programmes, participants could also be consulted on major issues. Could the mediation of a citizens’ vote unblock alliances? Nouvelle Donne and Place publique have both responded positively to Hamon’s call. “Nouvelle_Donne works to bring together ecologist, progressive and pro-European movements. We welcome the call of @benoithamon,” the citizens’ movement tweeted. The Socialist Party’s first secretary Olivier Faure has also faced calls to unite the left. However, for the Greens and La France Insoumise, the door remains closed. Moreover, the Greens’ lead candidate immediately rejected the possibility of citizen voting. 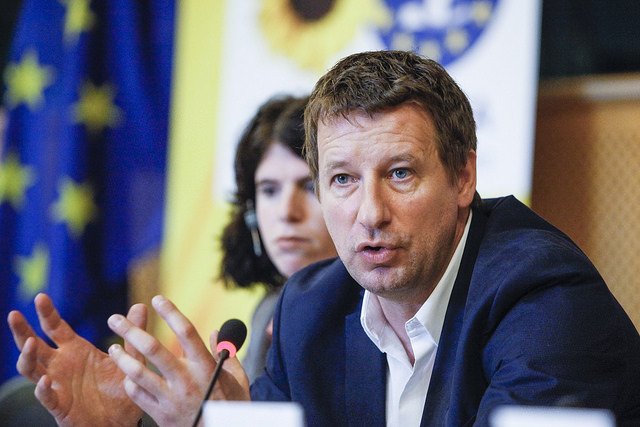 “Ecology is much more than the left,” said Yannick Jadot on public radio France Info on 8 February. “What I’m proposing, to all left-wing voters and, beyond, to all humanists, is opening a new political page in Europe of ecology,” he explained, highlighting the “disagreements on Europe,” among the various left-wing groups. La France Insoumise, whose list for the European elections is headed by Manon Aubry, has not yet responded to the proposal by Génération.s. However, the failure of the alliance proposed by Hamon to Jean-Luc Mélenchon during the June 2017 presidential election suggests that there would be a similar outcome. While some of the left-wing groups’ policy positions are similar, such as opposition to EU free trade agreements, banning glyphosate and combating tax fraud, other issues divide them.